As well as supply shock absorbers directly to the manufacturers, we also supply shock absorbers for different makes of sidecars to replace the shock absorbers already fitted such as Louis Christian, Joe Heys, Derbyshire and a number of one off chassis. 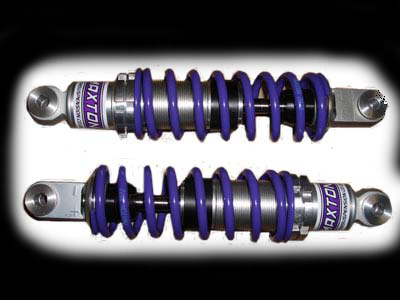 For the front of a Formula 2 sidecar (and the front of a Baker Formula 1 outfit) we supply a pair of Maxton Twinshocks. They are Alloy bodied dampers, externally adjustable for rebound damping, they have spherical bearings at either end to reduce the load on the seals and have threaded preload adjusters for infinite adjustment. For the front of a Formula 1 LCR outfit we supply a Maxton unit and remote reservoir. 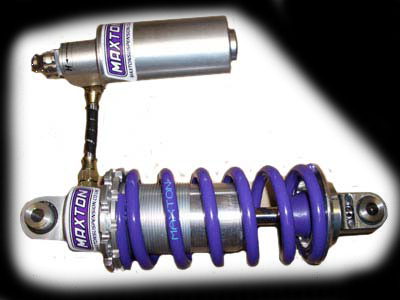 Maxton Gas Shock - This is adjustable for rebound damping, compression damping and preload as well. Because it contains gas it has a bigger range of damping adjustment and does not lose it's damping or "go off" in long races. The gas shock is recommended if you have a Formula 2 outfit and intend to compete at the T.T. Maxton Gas Shock with remote reservoir - This is adjustable for rebound damping, high and low speed compression damping and preload. Because it contains gas it has a bigger range of damping adjustment and does not lose it's damping or "go off" in long races. The gas shock is recommended if you have a Formula 2 outfit and intend to compete at the T.T. This is the shock used on Dave Molyneaux and Tony Baker and Terry Windle outfits. TO ORDER SHOCK ABSORBERS WE NEED YOU TO FILL OUT A SPECIFICATION SHEET FIRST. THIS IS TO MAKE SURE WE MAKE THE SHOCKS CORRECTLY. ONCE YOU HAVE COMPLETED THE FORM SEND OR FAX IT BACK TO US.